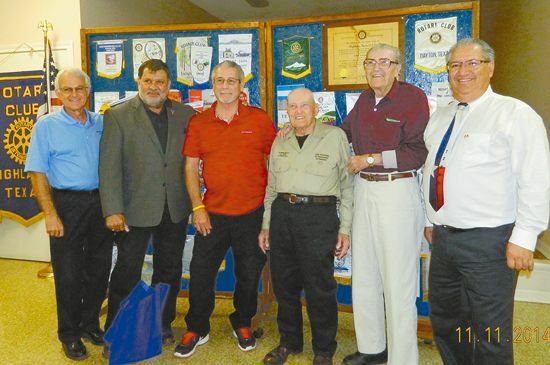 HIGHLANDS  On Tuesday, Nov. 11 which was Veterans Day, the Rotary club had a program that honored all veterans, and also those in the club who had served in the military. A highly entertaining account of his military career was presented by Raymond Holub, the 90-year old veteran from Highlands who was decorated with a Bronze Star. Also presenting information about veterans services provided by Harris County Precinct 2 was Gil Sosa, director of services for Veterans in the precinct. Holub was in the army during World War II, he related, having previously been in the Civilian Conservation Corps as a teenager. After basic training, he volunteered for the Paratroopers, joining the 17th and 82nd Airborne squads. However, on his first assignment to fight in Europe, his troop ship was involved in an accident at sea, when two German subs attacked their convoy, disabling a French aircraft carrier that went out of control and rammed their troop ship, with the loss of hundreds of lives. After 14 days not moving, near the Azore islands, they finally were able to reach England. Eventually his unit fought in Germany, reaching Essen and Berlin. After Eisenhower set up headquarters in the area, Holub managed to be assigned there as an honor guard. After Holubs retirement from the army, he re-enlisted and served in the Korean War. Gil Sosa is in charge of the office of Veterans Affairs for Pct. 2, and explained to the club what services and benefits were available to service men and women. His office is located in the Highlands Community Center. Sosa is also a veteran, serving in the Army during the Vietnam War, he said, and sustaining injuries. Sosas office now is providing services for more than 8000 veterans in the precinct. These include transportation to the VA Hospital twice a day in each direction, he said. Also available is counseling on subjects such as compensation for wounded conditions, and PTSD conditons often suffered by veterans, including nightmares, depression and anxiety. Sosa said that they also have to deal with homeless veterans at times, although not a large number are in the area. 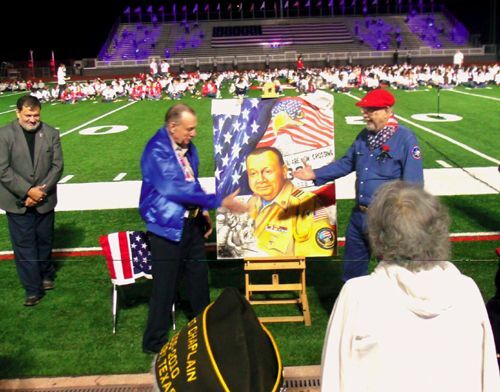 Other sources of support include the Texas VFW Foundation. He said that state provides a program known as Texas Veterans Benefits (2004) that includes areas of free parking through the state, and lower mortgage rates. Sosa made the point that everyone knows or is related to a veteran, even if they are not one themselves. You can call his office for an appointment for help, and if necessary even a house call can be arranged. The phone number is 281-426-2832, or email at veterans@ precinct2gether.org. In addition to the veterans programs, Jessica Woods from the Chamber told of their Thanksgiving plans, including Thursdays Pot Luck luncheon, and had club members vote on the best Thanksgiving baskets made by students from Highlands Elementary and Hopper Primary. The baskets will be filled with food for needy families, and distributed at the Thanksgiving Holiday. CROSBY  The Eastside Veterans Celebration was three days of events to recognise Veterans Day which was officially Tuesday but the celebrations were Thursday, Friday and Saturday. Students and a fireworks display were Thursday. A Cook-off was Friday. Saturay began with a parade and a special Veterans Fete was Saturday.